When it comes to increasing the overall appeal as well as the value of your home, choosing the appropriate custom house painting service providers usually has its inherent benefits. For instance, you are sure of getting the ideal value for your time and money since this type of service provider usually has sufficient experience and professionalism to be able to accommodate all your unique custom home decorating needs. 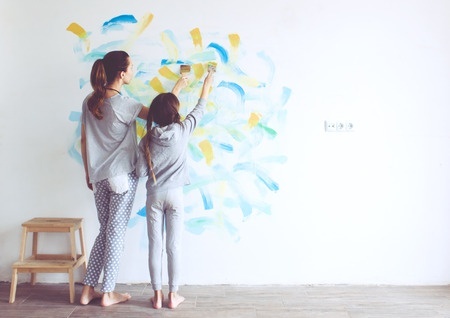 Whether your have your custom ideas, or you want suggestions for your home, Michigan custom painters are ready to assist you when you need it the most. Michiana Paint in Elkhart, IN services help you to convert your dream artwork into a reality by expediting a top-quality job on your property from the inside out. We take all your unique recommendations and requirement into account to ensure that you are not only satisfied with the final Custom Paint Job, but you will always be inclined to come for repeat services. Whether its custom art painting or simply a conventional Painting procedure, Michiana Painters have a service package that has been calibrated over several years of experience to suit your unique needs each time. While painting the home might seem like a simple procedure, it is a process that requires sufficient skills and expertise to complete the job with satisfactory results. This is especially the case when it comes to handling the various requirement that most clients typically want for their home. More so, they also provide you with additional custom home painting Ideas such that you are spoilt for choice. No doubt that the final result speaks for themselves. The paint job will not only be appealing, but it is also implemented to ensure long-term results and to withstand common stains and dust. All prospective clients will also appreciate knowing that Michiana Paint Services have pre-screened all our staff members to ensure that the client always receives the best team to tackle their painting issues. What is more fantastic is the fact that all the client needs to do is to contact us at 574-207-4612, and the painting team will be availed to your property in a timely fashion. We know that your property is a significant investment for you, and it is for this particular reason that they will handle it with utmost care. Unlike conventional service providers, Michiana Painters also help you in coming up with a custom house painting cost scheme, that is not only affordable but is also filled with packages and benefits for the clients. In this way, the client is more than likely to receive optimal value for their personalized house painting investment needs. Finally, choosing the correct service provider for your property is important if you want your home to look appealing even over the long run. You want a painting service that is both professional and reliable enough to assist you during the entire process and at affordable prices. Additionally, it is equally important that you select a service provider who can cater to all your custom painting needs for satisfactory results and that is why you should contact Michiana Paint.